​Over the years, thousands of films have released in the Malayalam film industry. There are easily more than 1000 movies which have attained a cult status and are a must-watch. To pick the best films from this list is a herculean task. But we are compiling a list of few Malayalam films any movie-lover must watch at least once in their lifetime and we are providing a review on each movie. At our 'Keli Movie Club' we watch a movie (All Languages, mostly Malayalam), discuss and write a review to share with likely minded members of the society. Ozhivudivasathe Kali (English title: An Off-Day Game) is a 2015 Indian Malayalam indie drama film directed by Sanal Kumar Sasidharan, based on the short story of the same name by Unni R. The film follows five middle-aged men who get together for a booze party during an election holiday in Kerala. It won the 46th Kerala State Film Award for Best Film. The film was initially showcased at the festival circuits on October 2015, including the International Film Festival of Kerala and the Mumbai Film Festival. The film has only 70 shots, with the second half of the film being just a single shot. Under Aashiq Abu's initiative, the film got a limited theatrical release in Kerala on 17 June 2016. 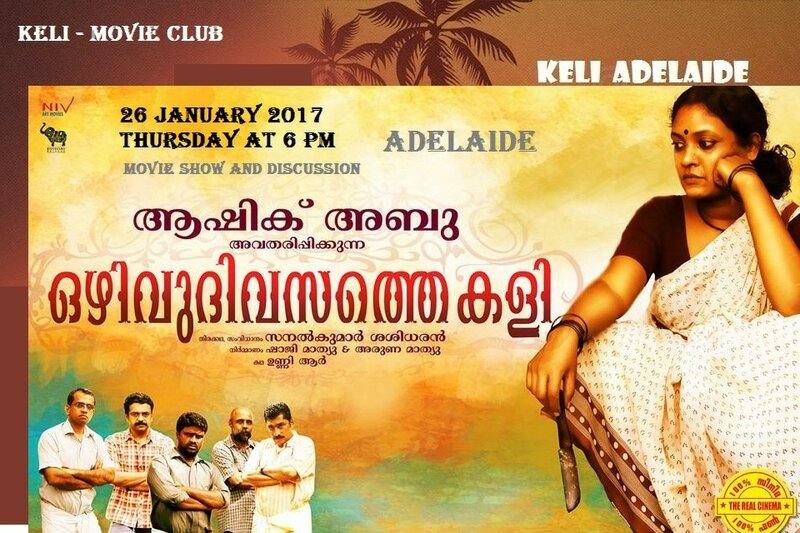 Keli Movie club, is organising a movie show and discussion about the movie in Adelaide on Thursday the 26th of January 2017 from 6 pm.